A relative comes forward with new biographical info and rare photos of Minnesota Fats and his folks. Fig. 1: Fats and his wife, Evelyn, right, visit his mother, Rosa, in this never-before-seen photograph from 1944. A few years back, I struck out for New York City with a mission: I wanted to discover something new and true about pool's most iconic figure, Minnesota Fats. And so I visited his old Washington Heights neighborhood, and I spent some time in the New York Public Library, and I visited with pool historian Charles Ursitti. During the trip I discovered the location of Fats' old home in Washington Heights, and I found clear records of Fats' early family life from documents in the U.S. Census Bureau database. The result was a column in the December 2005 issue, "In Search of the Real Rudolf Wanderone." But eventually I hit a dead end. I found references to his family, his home - his actual street address - and then nothing. 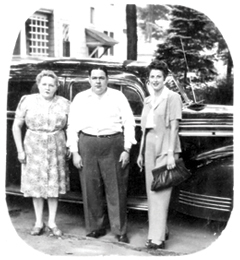 Fats had three half-sisters: Rosa, Julie and one other. I found references to them in Ellis Island records, but had no idea what had become of them, nor any clear way of tracking them down. "Dear Mr. Dyer: My mother, Bertha (Jerrie) Wanderone was one of Rudy's three sisters. Jerrie died in 1945 at age twenty-five after complications following childbirth. I'm the oldest of her two sons. I just thought you would like to know." Welcome back to Untold Stories. When I wrote that earlier column, back in 2005, I ended up raising as many questions as I answered. I figured out where Fats lived as a child, but had no clue as to what had become of his sisters. I knew he had three sisters, but couldn't figure why it was that some documents named them as Rosa, Julie and Jerry and others identified them as Rosa, Julie and Bertha. And why were so many people living in Fats' home in Washington Heights? Now, thanks to Doug Corwin, we have a few answers. Doug also has generously provided some never-before-seen photos of young Fats and his family. You can see them splayed across these pages marked as Figures 1 though 7. I'll get back to those later. But first off: a bit of context and a very quick review. Minnesota Fats, according to market studies that have been described to me (but which I've never actually seen), has the most recognized name in pool. Although I have not independently verified this claim, business types tell me it's true. Other recognizable names include Jeanette Lee, Willie Mosconi and Steve Mizerak - but the name "Minnesota Fats," I'm told, tops the list. So we start from this premise: Fats, apparently, has the most famous name in pocket billiards. And of course we all know where he got that name. He got it by glomming onto the craze surrounding "The Hustler" in 1961 and renaming himself after the character played by Jackie Gleason. But Fats was also one of the sport's great entertainers and promoters, and he managed not only to ride the pool wave but to keep it going through the 1960s, 1970s and 1980s. In the process, Fats rightfully earned for himself a spot in the BCA's Hall of Fame. We know also that Fats' real name is Rudolf Wanderone Jr., that he claims to have been born on Jan. 19, 1913, and that his parents' names were Rudolf Sr., and Rosa. We know that Fats had the three aforementioned half sisters, and that he married his first wife, the former Evelyn Grass, in 1941. We know he divorced her 36 years later and that he married his second wife, Theresa Bell, in 1996. And we know that he died in Theresa Bell's home three years after that.